Klein ISD named a Texas Education Agency (TEA) Model School District for Family Engagement, one of only three districts in the State to receive this designation. An instrumental part of the success of our Build Community priority has been the Family Engagement Program under the leadership of coordinator, Maria Ovalle Lopez. As a direct result of her vision and dedication, Klein ISD was announced as a Texas Education Agency (TEA) Model School District for Family Engagement, one of only three districts in the State to receive this designation. “The Family Engagement Program empowers families to work collaboratively with campus staff and support their children from Promise to Purpose,” said Lopez. As part of the Build Community strategic priority, the program aligns with the Dual Capacity Family Engagement Framework which focuses on effective home-school partnership strategies and forming strong relationships. To gain a better understanding, Klein ISD educators have learned directly from the co-creator of the framework and help build capacity in the district by sharing their new learning with colleagues. Partnering with other districts to offer additional professional learning opportunities has also been implemented. Engaging, educating, and equipping families is crucial as we Build Community in our district. Family Engagement staff members utilize evidence-based curriculum to offer a variety of resources to parents and caregivers. These include classes for parenting skills, health and wellness, and more. 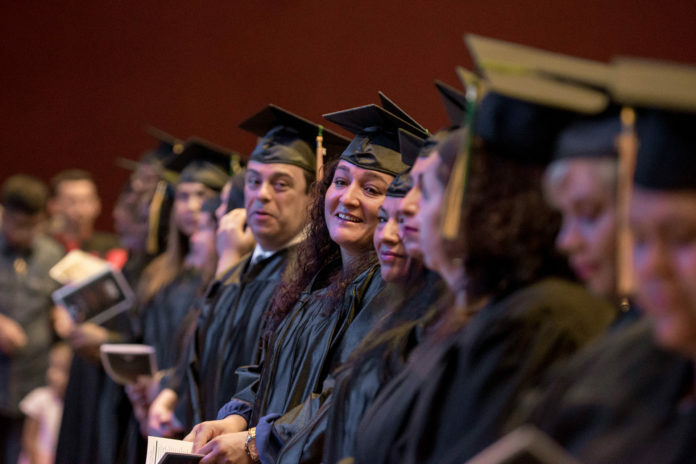 One of the most significant opportunities is Parent University, a program in which parents walk across a graduation stage after attending at least five family sessions during the school year. The May 2018 ceremony set a graduation record with more than 230 graduates. Family Engagement also collaborates with several community partners, including Harris County Department of Education and Lone Star to provide Adult ESL education and faith-based organizations, such as, Champions Forest Baptist Church and Bridging for Tomorrow to create networks of support for families. To serve as many families as possible, the Family Engagement Program continues to grow. The program originated within the Klein Forest Family of Schools but has expanded to nine more campuses this year as they deepen their efforts to continue building community. “We will continue celebrating the progress of the schools where the program is already established, and look forward to continuously improving and growing,” said Lopez.